Inspired by the local rescue of over 50 Pit Bulls from a dog fighting ring this pendant is dedicated to the precious dogs who do not make it. 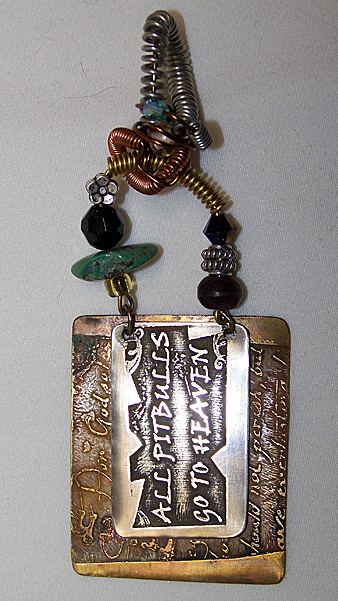 The top piece has the text "All Pit Bulls Go To Heaven" in etched nickel silver and is hinged over the second piece of etched brass which shows a partial text from John 3:16. The metals have an antique patina. The pendant is 1 1/2" wide and 4" long including the bail. The bail is extra wide to accomodate a variety of necklace options. Designed and made by Mary Smith.